Tochigi Prefecture, only two hours away from Tokyo by train, is filled with places of scenic beauty! From the famous Ashikaga Flower Park to less-known beautiful places, we introduce five spots that offer fabulous views in the four seasons. Tochigi - So Many Scenic Views! If you are getting tired of landscape photographs that all look the same, visit Tochigi Prefecture, which is only two hours away from Tokyo by train. Tochigi offers a wide variety of scenic beauty, and many of its nature sights are not so well known to the public. The following is a list of spots that will look amazing on the SNS! Ashikaga Flower Park, which is no less than 9.4 hectares wide, is famous in Japan for its giant wisteria trees blooming from April to May every year. The park, originally called Hayakawa Farm, opened at another site in 1968, and moved to its current site in 1997. Four wisteria trees, the symbol of this park, were transplanted over a period of four years with great care. The trees were said to be 130 years old at the time, and there was no precedent in Japan for such a transplantation. After the transplant, the wisteria trees were revitalized, and they subsequently expanded to a size fifteen times larger than at the beginning. It is now called the kiseki no o-fuji (miraculous large wisteria). Come spring, visitors can enjoy four types of wisterias in light pink, purple, white and yellow, along with their fragrance. Ashikaga Flower Park was chosen as one of the "Dream Destinations for 2014" by the American company CNN. The vitality of the wisteria trees, supported by the numerous staff, has created a scenery which can be called the miracle of Tochigi. The park offers great views throughout the year. 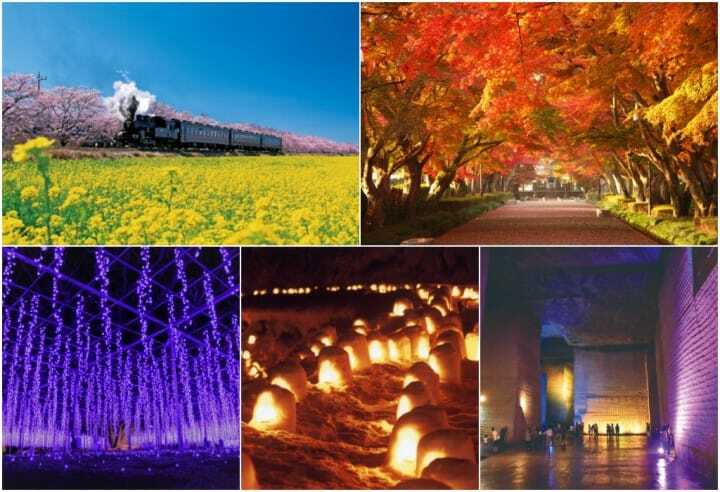 In 2017, the winter season flower-themed illumination was chosen as one of the Three Best Illuminations in Japan. A walk through the park that is covered by a veil of light, will make the visitors feel as if they are listening to a warm, beautiful winter love song. Add a black steam locomotive to a backdrop of a blue sky, pink sakura (cherry blossoms) and yellow colza flowers. The result is a great angle for a wonderful photograph! Many photographers and railroad enthusiasts visit the Moka Railway in Tochigi Prefecture every year from March to April, to capture images of the steam locomotive against the backdrop of a clear sky, sakura and colza flowers. This scene can be seen only at this time of the year in the weekends and holidays, at the Kita Moka Station of Moka Railway. The steam locomotive runs through the field filled with sakura and colza flowers, blowing its whistle. The scene is a collaboration of steel and flowers that will keep the visitors' eyes riveted. In April, various sakura festivals are in held in Moka City, and the area will be filled with mikoshi, live performances and food stalls serving tasty dishes. The general term for this festival is the Festival of the Ten Thousand Sakura Trees in Moka, and the visitors can enjoy the long rows of sakura trees lighting up the city. Although there are promenades all over Japan where sakura trees create a tunnel, one that features autumn leaves is rare in the urban areas. From JR Nishinasuno Station, it is a five minute walk to Oyama Sando, a unique promenade with autumn leaves. It is located at Oyama Park, where the graveyard of Oyama Iwao, a general of the army in the Meiji Period, is also located. About eighty Japanese maple trees are planted on both sides of the approach, which is 180 meters long. The lush trees in spring and summer change their colors into burning red and yellow in fall. The branches of ninety year old trees reach over the approach, creating a tunnel of autumn leaves. Each maple tree changes color at a different timing, creating a breathtaking scenery of gradation in green, yellow, red and orange. Access Five minute walk from the east exit of JR Nishinasuno Station. The beauty of Tochigi even reaches into the underground. Oya History Museum is located at a former underground quarry, which was dug out by human hands. It is almot two hectares in size, and the works of the miners can be observed on the walls. After the quarry was closed, the site became a museum about the history of stone quarrying in Tochigi. Looking at the illuminated underground chambers, some people may feel like they have wandered into a mysterious palace. This site has also drawn attention from filmmakers and advertising agencies in Japan. For example, one of the scenes in the film Rurouni Kenshin: Kyoto Inferno, a live-action movie based on a popular manga, was filmed at this museum. Even wedding ceremonies are held at this site. A photograph in a wedding gown at this setting should make a lasting memory. The museum will also be closed from December 25 to January 1. Access From bus stop no.6 of JR Utsunomiya Station west exit, take a bus bound for "Oya Tateiwa," and get off at "Shiryokan Iriguchi" bus stop. It is a five minute walk to the museum. Many people might imagine a vast snowfield when they think of winter scenery in Japan, but some may find that image a little weak. Take a look at this photograph. This is a scene from the Yunishigawa Onsen Kamakura Festival, held from late January to early March. The lights, resembling stars on a field of snow, are candles placed in a small kamakura (*1). Visitors can even enjoy barbecues inside a room-sized kamakura. The Yunishigawa Onsen Resort community supports this festival, and it has been chosen as one of the Night View Inheritance sites of Japan. *1 Kamakura: A snow hut. The legend goes that just before the the Kamakura Period (1185 - 1333), members of the Heike clan, who lost a crucial battle with the Genji clan, fled to the area which is now called the Yunishigawa Onsen Resort. Heike no Sato, one of the main venues of the Kamakura Festival, is a theme park re-creating the lives of the Heike clan. It is a well-known sightseeing spot, along with the onsen and the festival. More than 800 years have passed since the arrival of the Heike clan, but their marks can still be found in the area, and will go down in history. Access From Yunishigawa-Onsen Station, it is a thirty-minute bus ride to Yunishigawa Onsen bus stop, which is the last stop. Other facilities are free of charge. There are other places of scenic beauty in Tochigi Prefecture besides the five spots mentioned above. Visitors come to Tochigi to escape the heat in summer, to enjoy the snow and onsen in winter, while the autumn leaves last for two months. If you hope to take beautiful photographs for your SNS, head for Tochigi! ** When taking photographs, please observe the rules and stay away from restricted areas. Photographs courtesy of Tochigi Prefecture.